Jim Thorpe, the legendary Olympic champion and all-around professional athlete, was awakened from a deep sleep by a ringing phone at two o’clock one morning during the summer of 1938. Cecelia Blanchard (Kickapoo), co-founder with Thorpe of the Indian Center in Los Angeles, was on the line with an urgent request. Could he drive over to the Center immediately and help her save a woman and her two children who were huddled on the doorstep and appeared to be near death? They looked to be starving, and their clothing consisted of a couple of torn flour sacks. Thorpe got dressed, jumped into his black 1931 Model A Ford and drove the 11 miles from his home on 3904 104th Street in Inglewood to the Center on 7th Street. Upon his arrival outside of the brown clapboard, converted house, in a scene reminiscent of his athletic days, the now 50-year-old Thorpe sprinted up the 100 steps to the open front door and knelt down to reassure the woman, “Don’t worry. We will get you some food and medicine right away.” He handed Blanchard some money to cover the expense, and the two of them carried the little family down to his car for the drive to the hospital. Blanchard invited them to spend the remainder of the night at her home where they enjoyed a bath, one of her home-cooked meals and a warm bed. By daylight, Thorpe had collected enough money for clothing and a stay at a motel. A few days later, Blanchard found them a place to live and someone to help with the children, while Thorpe secured employment for the mother in the production office of the MGM film Northwest Passage. After an unprecedented athletic career, including gold medals in the pentathlon and decathlon at the 1912 Stockholm Olympics, Thorpe retired to a life of fighting tirelessly for Indian rights, especially in the motion picture industry. There was no obstacle in the world of sports that he had not been able to overcome, but, in the midst of the Great Depression, he was thrust into the maelstrom of modern earning and spending. 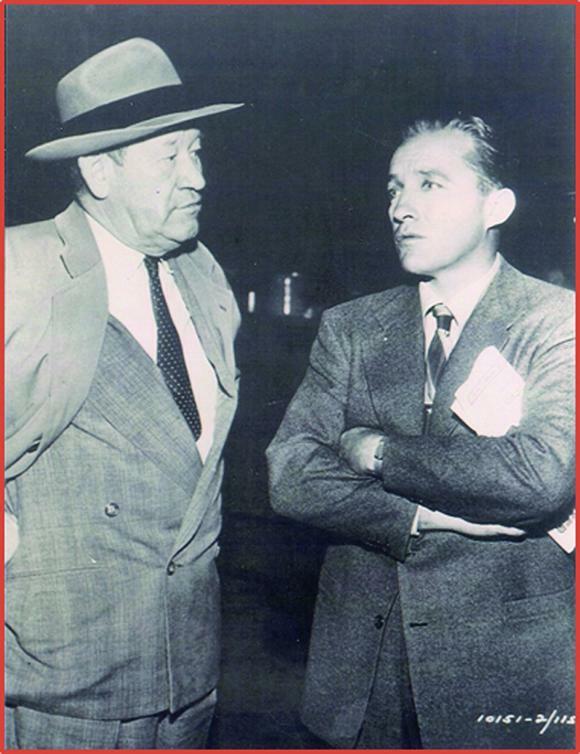 He traveled to Hollywood, where he sold the rights to his life story to MGM. 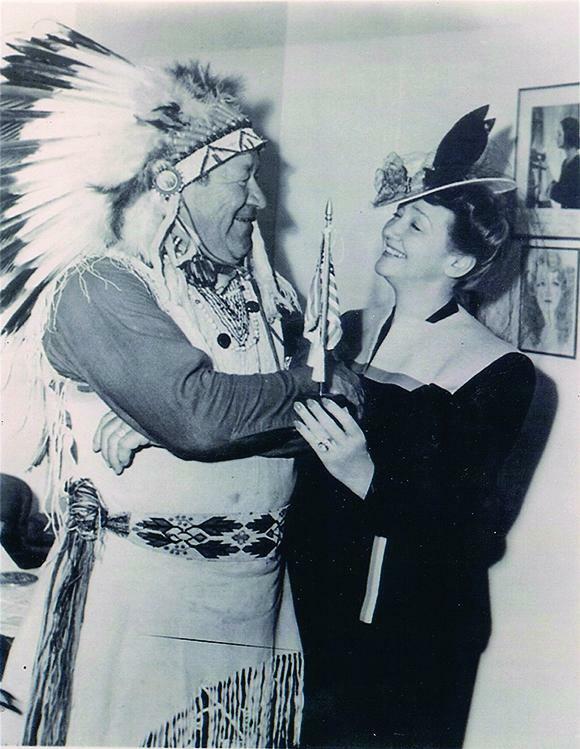 “He stayed in Tinseltown,” wrote Kate Buford in Native American Son: The Life and Sporting Legend of Jim Thorpe, “where being an Indian added to his athletic fame and gave him a competitive edge he couldn’t get anywhere else.” Universal Studios was the first to hire him, casting him as Chief Black Crow in Battling with Buffalo Bill in 1931. Soon, MGM hired him for a baseball film. Later came a football picture with his old coach, Glenn Scobie “Pop” Warner. 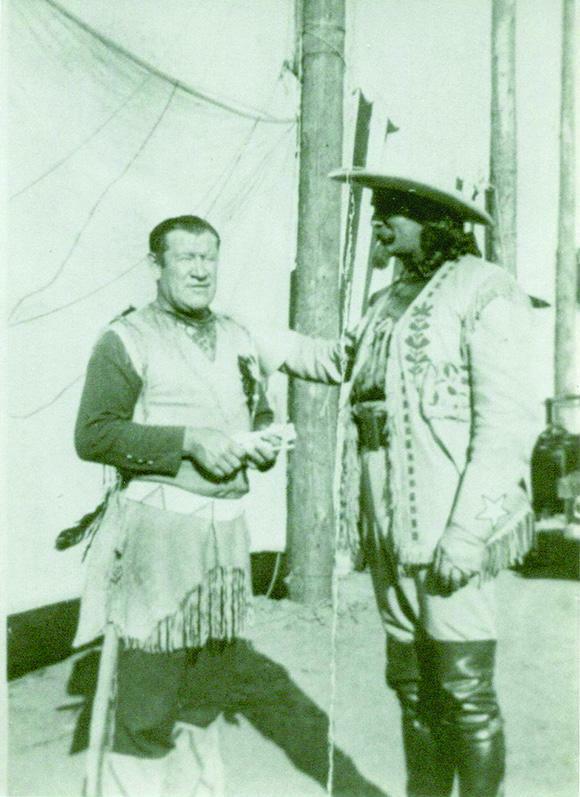 More than 70 films followed, mostly of the western genre, where Thorpe was usually cast as an Indian or athlete. His most notable performances were in Always Kickin’ (1932), My Pal, the King (1932), Wild Horse Mesa (1932), The Red Rider (1934), Code of the Mounted (1935), Wanderer of the Wasteland (1935), Treachery Rides the Range (1936), Wildcat Trooper (1936),Trailin’ West (1936), Klondike Annie (1936), The Man From Texas (1939), Arizona Frontier (1940), Prairie Schooners (1940) and Outlaw Trail (1944). He appeared in 19 movies in 1935, his busiest year. In his final role, he played a Navajo Indian in the 1950 John Ford classic, Wagon Master. As the motion picture industry began to rise from the depths of the financial collapse of the 30s, Thorpe was in demand. His roles began to increase in significance and, with his determination and leadership acumen, he recruited Indians from across the nation for movie work. His experience as co-founder and first president of the National Football League in 1920 prepared him for his successful attempt to organize and launch the Indian Center. After many brainstorming sessions with Blanchard, the two submitted a grant proposal to the Bureau of Indian Affairs that was accepted. Thorpe’s son, Richard, now 81 and living in Waurika, Okla., and Paulette, currently a graduate student at the University of Oklahoma’s College of Atmospheric and Geographic Sciences, readily say that the rescue at the Indian Center was repeated countless times. They recalled this lesser-known period of Thorpe’s life in an exclusive interview with American Indian late last year. Thorpe’s new career included not only earning a living for his family, but also assisting others. When he wasn’t on location for a movie shoot, many Fridays would find him with Cecelia, and her husband Lee, poring over the lists of Indians seeking employment and matching them with upcoming casting calls and auditions. (The Blanchards, in addition to their acting skills, quickly established a reputation as the top authentic Indian costume designers in town). After dinner, Thorpe would counsel the prospective job seekers while Blanchard would hand each person a sheet of paper she had prepared with individualized instructions for a specific employment interview. 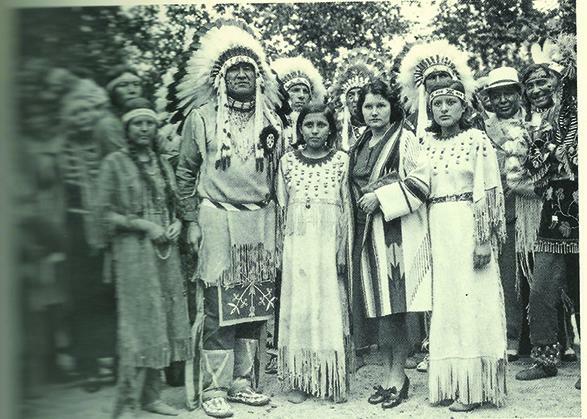 Their creation of the Indian Center and their innumerable dinner fires not only provided hot meals and camaraderie during a time devoid of adequate welfare or food ministries, but also gave birth to the Native American Actors Guild, which, at the time, was denied membership in the Screen Actors Guild. 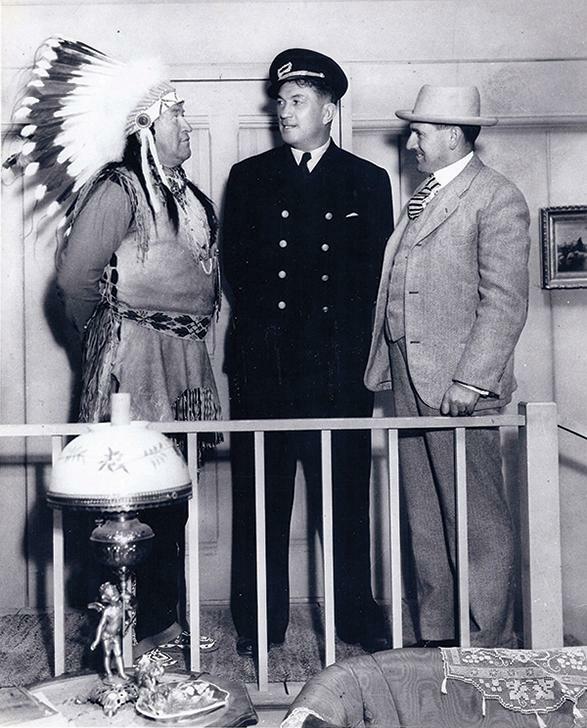 He was the leader among Native people in Hollywood. He had the biggest name, the most connections, and when he wasn’t lobbying with movie moguls, he used his fame to give speeches across the country to tribal, government and civic leaders, and schools and universities on behalf of Indian advocacy or simply to educate people on Native issues. Bob Wheeler is the author of Jim Thorpe: World’s Greatest Athlete. He and Dr. Ridlon founded the Jim Thorpe Foundation in 1982. Florence Ridlon, PhD, is the author of several books, most recent of which is A Black Physician’s Struggle for Civil Rights: Edward C. Mazique. Rob Wheeler, their son, is a Massachusetts Institute of Technology graduate working on his doctorate in Aerospace Engineering at Texas A&M University. In 2011, he created a website, JimThorpeRestInPeace.com, whose mission is the restoration of Thorpe’s remains to Sac and Fox land in Oklahoma.